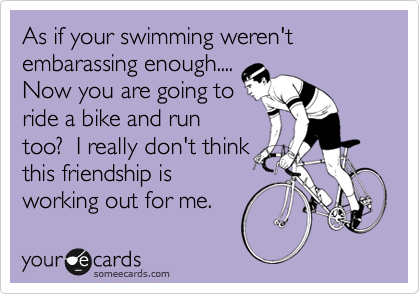 In light of all the funny photos, you may have forgotten about the reader-submitted embarrassing triathlon stories. Ah-ha! “The very first triathlon I did was the Danskin in Pleasant Prairie Wisconsin in 2002. I didn’t train all that well and was definitely not prepared, clothing-wise. I wore a regular bathing suit for the swim and decided to “throw on” a sports bra over my suit for the bike and run, not taking into account that I’d be oh, I don’t know, SOAKING WET after the swim! I ran to the transition area, grabbed my sports bra and promptly got my arm stuck up and behind my head with my sports bra rolled up under my armpit. Needless to say it took me a couple of embarrassing minutes to finally get the bra unrolled and set my arm free. Not to mention it killed my shoulder to have my arm stuck up and behind my head like that. I can only imagine what the other athletes and spectators thought when they saw me flailing around, hog-tied by my evil sports bra. Not one of my more dignified moments, to say the least! – Jen just finished her first tri! Read more from Jen at Big Girls Don’t Tri…Or Do They? – Mickey is an awesome triathlete and superb spinning instructor living in San Diego. Thanks for the laughs! – Matthew is a Swim Bike Dad to the cutest boy in the world. Congrats to all the winners, and thanks to EVERYONE for your submissions. We’ll do it again soon. Top three winners – you have a choice of a SwimBikeMom/Dad t-shirt, gym bag, or water bottle. Honorable mentions – you’ll get the fancy Trek water bottle. Details: winners, please email me your: 1) preference of swag (top 3 winners); 2) size if applicable; 3) whether you want “mom” or “dad” gear; and 4) where to send it! You can email me at: SwimBikeMom at Gmail.com. Thanks again for your participation, and for TriCrowd’s help in spreading the word! Looking forward to the next giveaway. HOORAY! Thanks so much, Mere! OMG, that story about the pee is *nasty*. Congrats winners, those are truly terrible moments!